R.L. Diorio uses Dupont Tyvek Housewrap on all of the homes it builds. Also the insulation package on every home includes an air infiltration treatment that helps seal the house from unwanted outside air and drafts. Diorio uses high efficiency furnaces and air conditioners in all of its homes. For off-site projects where natural gas may not be available R.L. Diorio recommends a Geothermal HVAC System. Propane/Gas furnace systems are also a good alternative for offsite construction. R.L. 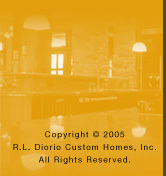 Diorio has been a Pella window user for over 20 years. Pella's commitment to excellence in product quality, energy efficiency and service are second to none in our opinion. In addition to our innovative designs and quality construction energy efficiency is at the top of our priorities.